After having read the recipes for Goulougoos from Dr. Jantzen’s mother-in-law, Isgouhi Sarkahian, and the one from the Magzanian sister’s cookbook, I decided to create my own version. On to the grocery store: Malanga; chick peas, lamb - check. All other ingredients are readily on hand. I combined the parts of two recipes I liked best, then added my own twist. I decided that canned chick peas would save preparation time, too. (Forgive me, purists!) It takes some time to make, but on a cold, wintery day, you’ll be glad you made the effort. Word of advice: if you have all of your ingredients prepped and ready to go ("mise en place", in culinary terms), it will save you time in the long-run. **Robyn's note: Can't find malanga? Use potatoes instead. 1. Drain and rinse chick peas. Set aside until ready to use. 2. In a large bowl, cover the peeled and cut malanga with water. Add lemon juice and a dash of salt. Set aside. 3. Place lamb pieces in a large pot. Add enough water to cover meat and bring to a rolling boil, cooking for several minutes. Drain and rinse meat to remove any scum that has risen to the surface. Wash out the pot to remove any scum residue as well. 4. Return meat to cleaned pot; add enough water to cover meat. Add salt and pepper to taste, and bay leaf. Cook, covered, for about 1 to 1 ½ hours or until meat is tender. Discard bay leaf. 5. Drain malanga. Add it -and- chick peas to meat. Cook about another 20 minutes, or until malanga is tender. A. Using a 3-quart saucepan, combine beaten egg with 2 cups plain yogurt. C. Cook on LOW heat, stirring constantly until yogurt is hot, but NOT boiling. 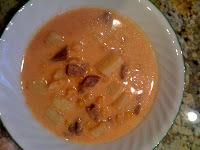 D. Add to soup once malanga is tender. E. Adjust salt and pepper to taste.